Raymond is an experienced Risk Manager with detailed understanding of industry practices, extensive hands-on experience in Financial Risk management, Contingent Liquidity Risks, Credit Risks, Risk Transfer (Insurance) and other applicable Operational Risks with special emphasis on Enterprise Risk Management training. He worked with the Dangote Group as General Manager, Group Insurance, where he was responsible for the global insurance administration of the Group. He was later assigned the role of the Financial Risk Management team Lead, saddled with ensuring that the organization’s financial risk management policies are in compliance with applicable regulations, rating agency standards and strategic imperatives of the organization. 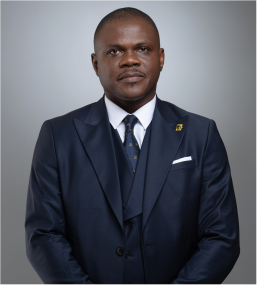 He was Lead Partner/CEO at Insurance and Claims Consult Ltd before joining FBNInsurance in 2017 as Head, Enterprise Risk Management. Raymond holds a master’s degree in Risk Management from the University of Lagos and an MBA from Abia State University and a BSc. Business Administration From Ahmadu Bello University Zaria. He is faculty member, Centre for Risk Management Development, a Fellow of the Risk Managers Society of Nigeria, an Associate member of the Chartered Insurance Institute of Nigeria and the current Deputy President, Risk Managers Society of Nigeria (RIMSON). He has attended both local and international training programmes one of which is “Changing the Game – Negotiation & Competitive Decision Making” held at the Harvard Business School, Boston, Massachusetts, United States of America.